Achieving work / life balance can be a challenge at the best of times, let alone when you work with your life partner! This afternoon we step into the work and personal lives of three couples who have nurtured incredibly successful small business (and relationships!) together. Jason Chongue and Nathan Smith of the Plant Society, Matt and Lentil Purbrick of Grown & Gathered and Poppy Lane and Scott Gibson of Pop & Scott share their own tips, tricks and rules (or lack thereof…) to maximise professional efficiency and find harmony in the tricky balance of work, life and love. Poppy Lane and Scott Gibson business Pop & Scott. Photo – Eve Wilson for The Design Files. When we asked Poppy Lane of Pop & Scott whether she and her husband Scott Gibson have any specific rules for maintaining their professional and personal relationship, she exclaimed, ‘No! Bloody hell! We need some rules!’ Though they seem to getting by just fine without! Having spent almost 10 years working together and sharing a business, a relationship and two children, a lot of their success comes down to mutual passions and ideas. ‘When Scotty and I first met and fell in love, it was because we loved dreaming and discussing ideas!’ Poppy explains, ‘I felt like we started working together the minute we met.’ If you and your partner are staying up until the wee hours talking about ideas, it may be time to take the next step! While they both have their designated roles (Poppy as Creative Director and Scott coordinating production and new designs), the couple finds having each other as support makes a big difference. 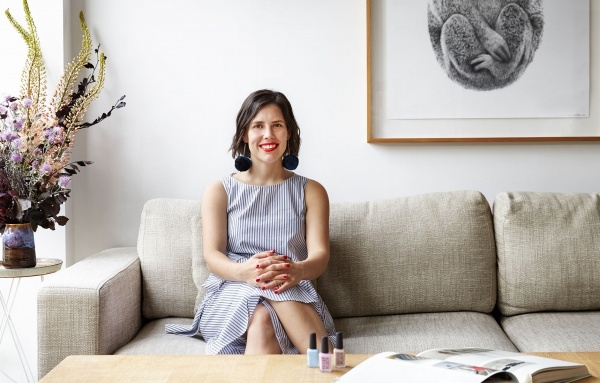 ‘Sharing the ups and downs of a small business with your partner can be confronting sometimes, but also very comforting,’ says Poppy, ‘sometimes you can get too deep into the issues with your business and take it personally’. Jason Chongue and Nathan Smith of The Plant Society. Photo – Caitlin Mills for The Design Files. After working full-time in their respective careers as an architect and a flight attendant, Jason Chongue and Nathan Smith of The Plant Society decided to take a change of direction, together. Creating specific roles based on their individual strengths and skills was important. ‘It happened organically, we began working on aspects of The Plant Society that we individually found most enjoyable,’ Jason says on how they initially began to define their roles. Working together on their rapidly-growing business for just over a year now, the horticultural lovers cite honest and open communication, patience and knowing when to give each other space as key to maintaining a successful work and personal relationship. Matt and Lentil Purbrick of Grown & Gathered. Photo – Eve Wilson, Styling – Stephanie Stamatis for The Design Files. As well as separate work spaces, Matt and Lentil make sure they have clearly defined roles, and a scheduled weekly meeting to go through everything they’ve been working on individually. ‘Throughout the week, we write things on a notepad that we might want to talk about, and then we meet once a week over coffee to talk through it all’, Lentil tells us. We talk stand-out job applications with Anna Ross of Kester Black and Abigail Crompton of Third Drawer Down.